It is so exciting that the warm weather is finally here, and we can start to pack away all those winter layers. As you may or may not know, but every fiscal quarter, DPM has a company wide planning session where our ever-growing company gathers to discuss the past quarter and the one that lies ahead. One new focus for this quarter’s planning session was the development of the Core 4, which provides clarity around who DPM is at the core. Our clients need us to contribute to their success and we want to create a culture that our employees are proud to be part of. 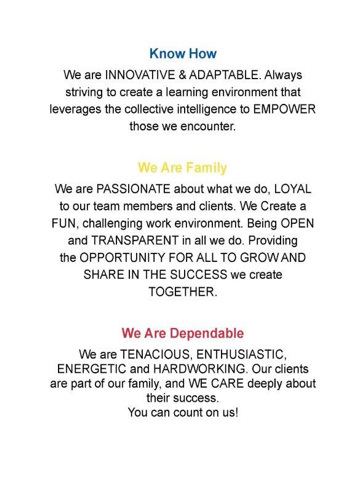 If you have been to DPM offices, you would see that our Core Values are proudly displayed on the walls. We even got our first Core Value Trademarked this year. We solve complex problems that keep your power on and streets bright. We will leverage our experiences and contacts. The amalgamation of these Core 4 helps solidify for our staff not only what we do each day but why we do it. We take great pride in the projects we help bring to fruition and the awesome partners we get to work with each and every day. Spring is a perfect opportunity for reflection of all our new growth and the future possibilities. We are proud of our Core 4 and every DPM employee will carry them every day both for themselves and their projects. So, here’s to a new season, to new projects and new adventures!